And they said HealthCare.gov is bad. 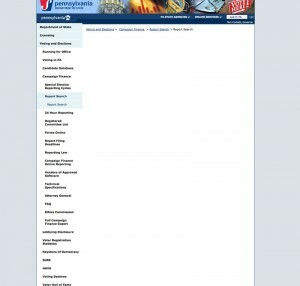 Try spending some quality time searching campaign finance reports on the Pennsylvania Department of State. I did this past week, as Tuesday was the always dreaded deadline for the Cycle 1 campaign finance report that has to be filed for state legislative candidates, as well as the state-wide races. Want data on who has raised money in the 74th District State House race? You’re out of luck — beyond finding where Downingtown Mayor Josh Maxwell ended 2013. Want to know where the three state house candidates in the 158th District stand? Beyond learning that Roger Howard, a Republican battling Cuyler Walker for the nomination, had $1,125.34 on hand at the end of Cycle 1, there’s nothing. Not even Susan Ruczidlo’s reports from 2010 and 2012, let alone her year end or Cycle 1 for 2014. Oh and try searching for the latest report (or any report) for Gov. Tom Corbett. Either you get nothing, or you learn that Democratic challenger Tom Wolf had $11,804,398.58 on hand as of April 8. Now, do you think all these candidates failed to file? Nope. I’m sure they did. I can speak to personal experience — not to mention checks written out of my personal account — that being a few hours late on a report brings a special hell down on campaigns, let alone not filing at all. I would be utterly startled to learn that any of these campaigns did anything but file in a timely and appropriate manner. No, the spotlight here falls on the Department of State, and its secretary, the former Chester County Commissioner Carol Aichele. Having talked to a few elected officials, it appears this new and highly unusable search engine is actually the new and improved version — which means some sort of management type at DOS had to sign off on it. The Department of State’s campaign finance site search engine appeared to have been taken off line by Saturday. I reached out to the Department of State on the matter Friday, but got no response. Interestingly, the entire search engine appeared to be down by Saturday. Draw your own conclusions from that. I’ll note that we haven’t seen much hue and cry about this (yet) — not say, compared to the wailing, much of it justified, granted, about the HealthCare.gov website. While federal Health Secretary Kathleen Sebelius was forced to fall on her sword and take the hit this week, it’s a good bet that Aichele won’t get heat for the utter uselessness of the Department of State website. And yes, that’s more than a little hypocritical — let’s face it, Republicans are every bit as capable of being completely incompetent at running government as Democrats, despite what the talking heads might claim. But it also misses the point. Aside from how merciless, unbending and unhelpful Department of State employees tend to be with campaign committees, there doesn’t seem to be any ability to make those employees accountable. Sure, we can vent at Aichele and get assurances that the new site software will be fixed (again). But why don’t state employees — many of them the same folks who served under Gov. Ed. Rendell, Gov. Tom Ridge and even Gov. Bob Casey — get fired when they do a lousy job? And why aren’t contractors — and this is especially true when it comes to HealthCare.gov — called out, fined and even blacklisted from future government work when they do a crappy, lowest-bidder job? Money is the short answer. Decades of public union spending on campaign contributions to elected officials in both parties, as well as contributions by companies such as CMS — the tech firm behind the HealthCare.gov fiasco — have helped foster an environment where hired guns and Civil Service employees can do virtually anything without paying any consequence. Even Corbett alluded to this issue in an interview earlier this year with The Times, noting that state employees have told him that they can outlast him, and can continue doing largely as they please. Maybe it makes us all feel better when Sebelius gets pushed out, or some lunkhead columnist takes shots at Aichele, but it doesn’t really help solve anything. Until we can take special interest and corporate money out of politics, the game — and government — will remain rigged and broken. What’s next, a pronouncement that the sun will rise in the East? I know the Pennsylvania sixth is a long way from Charlottesville, Va. (where Sabato is the political pundit guru in chief at the University of Virginia), but even casual observers around here don’t see this as a particularly close race. Write it down: Ryan Costello, the GOP nominee, will beat Democrat Manan Trivedi by eight points. From pretty much the second U.S. Rep Jim Gerlach announced his retirement, the 6th leaned Republican. The voter registration numbers in the district — not to be confused with the old version of the district — push a couple of points toward the GOP candidate in registration. Parrish seems like a nice enough guy — and it is possible that his centrist positions might have been attractive in a general election. But instead of explaining how he had evolved and moved toward Democratic principles, the Democratic Congressional Campaign Committee sent in a fairly obnoxious group of operatives who basically told local Democrats that they were idiots for questioning Parrish and that they, the DCCC, knew better. Trivedi got about 80% of the vote from local Democratic county committee people in the four counties in the district and Parrish was toast. And now of course, the DCCC has a candidate its operatives were trashing earlier this year in one of the most visible races in the nation. One sidenote: Rich Sestak, the brother of former Congressman Joe Sestak, managed the Parrish race and ruffled no small number of feathers — which makes one wonder whether the former admiral will get such a loving treatment when he seeks the 2016 U.S. Senate bid to unseat Sen. Pat Toomey. One has to think that Montgomery County Commissioner (and former State Rep.) Josh Shapiro is now seeing a much better shot to get support in Chester and Berks counties, as suddenly there are a lot less Sestak fans among Democrats in those two counties. Now, back to the 6th. So why eight points, you may ask? First off, figure two to three points just from the registration lean in the district and that Mitt Romney won the district in 2012, despite Democratic turnout that was likely much higher than it will be in 2014. Next, money. This is no knock on Trivedi, who I think will do a representative job here. But the truth of the matter is this: TV ads drive votes. Philadelphia local TV ads at election time are criminally expensive (supply and demand). Costello, on his own part, will likely out raise Trivedi by about 2-to-1. But the differential in outside money — in the form of Political Action Committees — could be massive. And if there’s even a hint that the race is closing to within five points, the airwaves will get bombarded with negative Trivedi ads. Figure three points of advantage here. The last factor is the candidates themselves. I like Trivedi and think he’s a thoughtful guy with a lot of interesting, well-considered policy positions. But since I first met Costello — I was managing the race for Recorder of Deeds against him — and thought literally “Crap. That kid is going to be governor some day.” I’d recognized him as one of the most naturally gifted politicians I’d seen in a while, an opinion that hasn’t changed as I’ve gotten to know him better. Costello’s skill set — and that he looks and sounds like someone playing a Congressman on TV — is worth a solid two points. So, there you have it: eight points as we stand today. Yes, there are things that could change the race — Corbett could implode (although his numbers are bad enough it would take some of sort of personal scandal to really change the overall race), or more likely, the Corbett race against Democrat Tom Wolf (and yes, he’ll win the Democratic nomination), will tighten and we’ll see enthusiasm build on the GOP side for the race. If the former happens, the race could tighten to five points — but again the outside money is something of a failsafe. If the latter happens, the race could open to about 11 points. 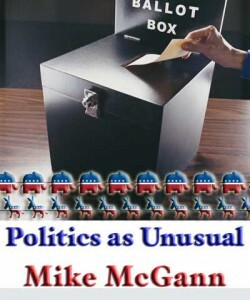 Mike, I had same frustration until I learned that 6-Tuesday report is only required of statewide office holders. SIXTH TUESDAY PRE-PRIMARY or PRE-ELECTION REPORTS are required to be filed only by candidates for statewide office, their authorized candidate committees, and any political committee or lobbyist that has made an expenditure to influence the election of a statewide candidate. You are correct, but a number of candidates do file Cycle 1, if only to show how they’ve done with fundraising. Also — you couldn’t get the statewide candidates numbers, either. Or almost anyone’s Cycle 7 numbers.